Mr. Granatelli was a motorsports legend - a car owner, entrepreneur and an innovator. R.I.P. Andy. MONTECITO, Calif. -- Andy Granatelli, the former CEO of STP motor oil company who made a mark on motorsports as a car owner, innovator and entrepreneur, has died. He was 90. Granatelli's son, Vince, said his father died Sunday of congestive heart failure at a Santa Barbara hospital. Granatelli is a member of the International Motorsports Hall of Fame, the Motorsports Hall of Fame of America and the Indianapolis Motor Speedway Hall of Fame. "Everything he did was bigger than life," Vince Granatelli said. "The thing that gave him the most gratification in his life was what he did at the Indianapolis 500." 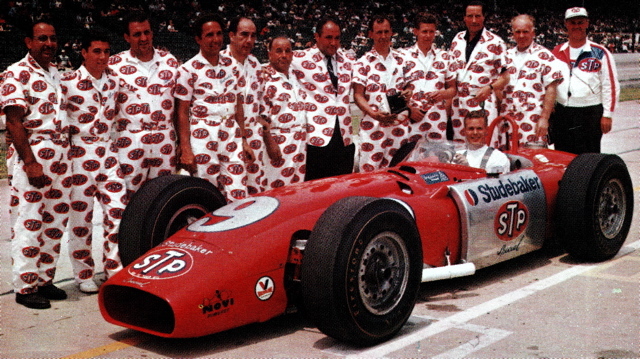 Granatelli's cars nearly won at Indianapolis in 1967 and `68 with turbine engines. He broke through in 1969 with Mario Andretti driving a car with a conventional engine. Granatelli kissing Andretti on the cheek in Victory Lane is one of the most famous images in Indy history. In 1973, Gordon Johncock gave Granatelli another Indy 500 victory. "Andy Granatelli -- known appropriately as `Mr. 500' -- understood better than anyone the spirit and challenge of the Indianapolis 500 and had a remarkable ability to combine innovative technologies with talented race car drivers to make his cars a threat to win at Indianapolis every year," Indianapolis Motor Speedway President J. Douglas Boles said in a statement. "Andy leaves a legacy of historic moments that will live forever in Indianapolis 500 lore." Granatelli was born in Dallas. He gained fame during World War II as a promoter of racing events, such as the Hurricane Racing Association.